Stanley Black and Decker recently became the first company internationally to open up their brand new “Manufactory 4.0” at Constitution Plaza in Hartford, CT. This 23,000 square-foot center will serve as a state-of-the-art advanced manufacturing center and training center for the company’s international industry 4.0 “smart factory” initiatives. This new facility will also help to highlight Stanley Blacker and Decker’s success with integrating industry 4.0 practices into their company’s policies, such as how they have improved communication between humans and automated technology, used interconnected systems to improve the collaboration between plants and solve problems, and utilize big data analytics to improve productivity and efficiency world-wide. Operated by a team of experts in the field, the facility not only aims to showcase the company’s continued work with integrating technologies and practices of the future into their current manufacturing technologies, but also to provide an interactive space where young professionals and younger children can see what types of career opportunities are available in advanced manufacturing. Based in New Britain, CT, Stanley Blacker and Decker operates and maintains approximately 30 manufacturing facilities across the US, and more than 100 facilities worldwide. Out of these locations, three facilities have been designated as “lighthouse factories”, which have been working to partially implement industry 4.0 techniques into their facilities and into other technologies, such as manufacturing execution systems (MES), artificial intelligence systems, 3-D printing, and virtual reality. Now, with the opening of the new Manufactury 4.0 facility, the company plans to integrate another 25 “lighthouse facilities” into their global base by the end of the 2019 year. The opening of the Manufactory will make Hartford the epicenter of the company’s industry 4.0 efforts. Not only will this help to integrate smart factory 4.0 technologies into Stanley Black and Decker locations world-wide, but it will also help to catalyze Connecticut’s evolution into the leading market for advanced manufacturing in the United States. A Manufactory is described as a training center, that utilizes industry 4.0 technologies such as digital thread, digital twin, IoT, ARVR and big data analytics to help connect manufacturing facilities world-wide and integrate new and innovative industrial technologies into the workforce on a united front. Through their virtual reality techniques, the center will work to assist other facilities world-wide in adopting leading edge-technologies and ensuring that the global workforce is adequately prepared for the new industry. One of the highlights of this facility is the demo shop floor, where the all the technologies and equipment are part of the facility’s digital thread. These fully specified machines, along with are used to train operators and mechanics around the world. Dr. Bollas and Dr. Thompson with the University of Connecticut UTC Institute of Advanced Systems Engineering attended the Stanley Black & Decker (SB&D) Manufactory Grand Opening last Thursday in Hartford with a contingent of faculty and staff from the University of Connecticut. SB&D’s CEO, Hartford’s Mayor, and Connecticut Governor Lamont all attended and spoke at the opening. This news clip captures Dr. Thompson discussing the capabilities of Infosys technologies with an Infosys representative. The Infosys technology monitors a parts orientation process and determines raw material, process, or machine errors and defects, real-time, with an intuitive, graphical user interface. The machine operator has the ability to determine problems with a better data set and with built-in AI that aids in the diagnosis of errors and faults. This data can then be used to better design the parts, improve the process and machine, or resolve supply chain quality issues. The SB&D Grand Opening was a culmination and celebration of a multiyear effort to launch the Industry 4.0 initiative at SB&D. The manufactory space’s purpose at this one-of-a-kind facility is to implement new augmented reality, virtual reality, AI, IoT, and Big Data technologies to support its development of digital threads and digital twins and improve product and manufacturing capabilities and efficiencies that coincides with the work being done at UTC IASE. The Institute for Advanced Systems Engineering looks forward to the opportunity to support them in this effort and to partnering with them to help make industry 4.0 a reality. On April 18th, Dr. Wolf Wadehn spoke at the weekly seminar series for the CTIN4SPIRE program. Dr. Wadehn is the Director of Engineering at TRUMPF, Inc. in Farmington, CT, where his work focuses on establishing his company’s US subsidiary as a global competence center for remote service tools, machine connectivity, and data analytics. Dr. Wadehn studied mechanical engineering at the University of Munich and Stuttgart and completed his Ph.D. thesis on adaptive structures. In 2005, he started as an engineer for TRUMPF, where he worked on numerical calculations for 5-axis laser machines until he started his management position in 2015. In his talk entitled “Smart Factories: Industry 4.0 in Sheet Metal Manufacturing”, Dr. Wadehn explained that his intention of his presentation was to disprove that manufacturing is “slimy and greasy” and only requires mechanical engineers. 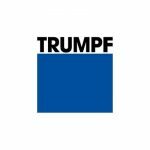 TRUMPF has been a family owned business since 1923, has 73 subsidiaries, and is comprised of 13,420 employees. The company specializes in using advanced machining and special laser systems for cutting, punching, bending, welding, marking, and other industrial applications. He described the company’s core competencies, such as innovative practices utilizing laser technologies and prioritizing “speedy” innovation, to segway into current technologies in the industry and what specialized smart factories of the future may look like. He handed out samples of laser cut material to the class, and explained the process of using a laser machine to perform specific tasks, such as cutting a material like the sample, which contained intricate small features. The sheet metal cutting machine will need to operate continuously throughout the process, and if it is not running continuously, manufacturing companies can lose thousands of dollars each day or each week, so uptime is crucial. He finalized the talk by describing how smart factories can be used to maximize efficiency of production and to minimize cost, and outlined the equipment and technologies that can be found in a smart factory. Dr. Wadehn explained seven (7) components of a smart factory: 1. Connectivity and transparency, 2. Full control of equipment, 3. Inventory management, 4. Full transparency on order status, 5. No searching times, 6. Automated transport with AGV, and 7. Remote support through experts. He used these components to illustrate how the current production practices can be improved upon. He also mentioned how smart factories create a smart material flow, which eliminates the possibility of any parts going missing. Dr. Wadehn closed the presentation by showing an example factory of the future and described what a customer’s smart manufacturing project would look like. He explained that smart factories use innovative technologies, such as AGV systems, predictive maintenance, and advanced software to increase the efficiency of manufacturing. In addition, the integrative concepts found in these factories provide jobs for more than just mechanical engineers; this type of work requires an integrative team of engineers and non-engineers from many disciplines to help the manufacturing process run smoothly. The CTIN4SPIRE program will be hosting two more talks this semester on Thursday April 25th and Thursday May 2nd. 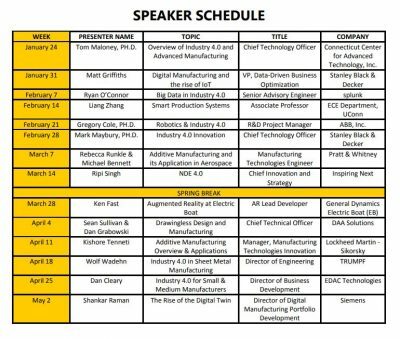 To view the CTIN4SPIRE speaker series calendar and to find out more about the series click here. The Connecticut Industry 4.0 Synergistic Platform for Innovation-Rich Education (CT IN4SPIRE) Program is an integrative state-wide initiative, wherein industrial experts will leverage the state’s higher-education and industrial resources to help train and prepare the future workforce and promote growth of Connecticut’s Economy. The purpose of the CTIN4SPIRE program is to utilize Connecticut’s academic and industrial resources to help prepare students, entrepreneurs, and industry professionals for the “Industry 4.0” innovations which will soon be the leading force in the near future. Participants in the program will learn how to apply the knowledge and concepts they have taken from this initiative, along with advanced digital technologies, to improve the state’s current industrial capabilities. The program will establish a revolutionary new course hosted by the University of Connecticut, where professionals in the field will instruct a weekly seminar series, focusing on new Industry 4.0 concepts and technologies. 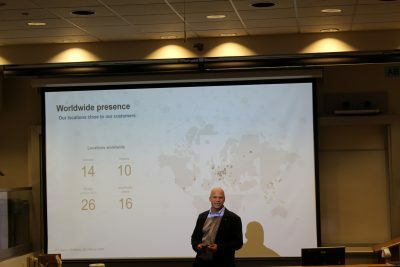 Each seminar will be live-streamed to each of the partner sites, to help connect participating companies, sites, and individuals together on one platform. The program will also feature two workshops per semester, focusing on real-time applications of I4.0 technologies and concepts, and challenge the schools, entrepreneurs, and workforce professionals to work together in project teams to tackle current obstacles in the industry. A panel of judges will select the best projects and innovative concepts, to be developed the following semester. Students will by design and prototype their solutions using UConn facilities and the Connecticut Center for Advanced Technology. Other project goals are to help train students in the real-world applications of advanced Industry 4.0 technologies, to catalyze industrial relationships between students and professionals, to incentivize and motivate students to join the revolutionary and innovative 21st century workforce, and to bring a sizeable change to innovation in CT’s industrial base. 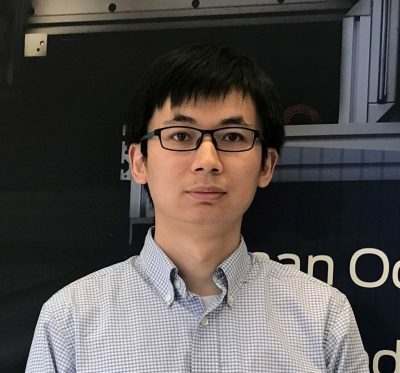 Please join the UTC Institute for Advanced Systems Engineering in welcoming Dr. Hongyi Xu, who has recently joined the Department of Mechanical Engineering as an Assistant Professor. Prior to joining UConn, he worked at Ford in their Research and Advanced Engineering Department from 2014 to 2019. At Ford, he worked on many projects such as structure optimization for vehicle lightweighting, integrated computational material engineering of carbon fiber composites, lithium-ion battery impact safety, fuel cell membrane analysis, and the design of mesostructured systems for additive manufacturing. He received his B.S in Mechanical Engineering from Northeastern University in China, a M.S in Mechanical Engineering from Tsinghua University in China, and a Ph.D. in Mechanical Engineering from Northwestern University in the US. His current research focuses on developing design optimization for the analysis and design of heterogeneous microstructural materials. His research interests also include Design for Additive Manufacturing and data mining-enhanced multi-disciplinary optimization. He is currently working on two research projects. The first project is titled “Microstructure modeling for lithium-ion battery materials”, and the second is titled “Design and uncertainty quantification of additive manufactured mesostructured-structure system”. In the past 4 years, Dr. Xu has worked on several government and private industry sponsored projects, including two Department of Energy funded projects. The first project focused on Integrated computational materials engineering for the development of carbon fiber composites of lightweight vehicles. The second grant worked towards the development and validation of a simulation tool to predict the combined structural, electrical, electrochemical and thermal responses of automotive batteries. In May of 2019, Dr. Xu will be traveling to Beijing to attend the World Congress of Structural and Multidisciplinary Optimization. There, he will be presenting on “Mesostructure Optimization for Additive Manufacturing Based on Multi-fidelity Modeling and Particle Swarm Optimization Algorithm”. In August of 2019, he will be attending the ASME 2019 International Design Engineering Technical Conference & Computers and Information in Engineering Conference, where he will be presenting on “Multi-Fidelity Variance and Sensitivity Estimators and Adaptive High-Fidelity DOE for the Design of Mesostructure-Structure Systems”. Dr. Xu has already had two papers published in the early months of 2019. He was one of the authors of a paper titled “Failure of chopped carbon fiber sheet molding compound (SMC) composites under uniaxial tensile loading: Computational prediction and experimental analysis”, which was published in Composites Part A: Applied Science and Manufacturing. He also was a co-author along with Liu Zhao on a paper titled “Control variate multi-fidelity estimators for the variance and sensitivity analysis of mesostructured-structure systems”, published in ASCE-ASME Journal of Risk and Uncertainty in Engineering Systems, Part B: Mechanical Engineering. Along with his papers already published, he also has two other papers that are currently under review. The first is titled “Modified multi-scale finite element method with the nodes linkage technique for predicting elastic property of metamaterials”, which in under review in Frontiers of Mechanical Engineering. The second paper is titled “Stochastic 3D Microstructure Reconstruction and Mechanical Modeling of Anisotropic Battery Separators”, under review in the Journal of Power Sources. The Sustainable Fairfield Task Force (SFTF) provides support for projects and initiatives that help Fairfield maintain the growth and health of its environment, ensure a proper and economical use of the town’s natural resources, and promote a high quality of life for all residents. Multiple municipal departments contribute to the SFTF, each of which focus on different aspects of Sustainable CT initiatives. The UConn team was primarily responsible for providing building energy benchmarking technical support to the Fairfield effort. The UConn team was led by Dr. Amy Thompson, an Associate Professor-in-Residence of Systems Engineering at the IASE. Two undergraduate students, Ian Beattie, a senior in Environmental Engineering, and Emma Atkinson, a senior in Biomedical Engineering contributed as well. 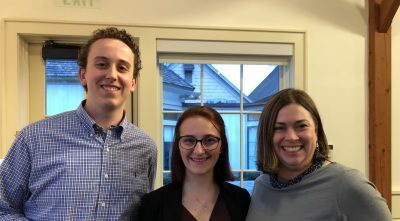 The UConn students collected building energy information and data from Fairfield and United Illuminating and used the EPA’s Portfolio Manager tool to provide building energy assessments for each of Fairfield’s 22 municipal buildings and 16 school buildings. The building energy benchmarking component was a key component in the Sustainable CT judging process. United Illuminating provided funding to the UConn IASE for faculty and student support of the benchmarking effort and also provided the real-time data exchange system that made the benchmarking possible. “United Illuminating believes that supporting engineering students in this project to learn more about building energy efficiency may encourage them to enter careers in energy engineering. The project allows students to see first-hand real issues and solutions for lowering building energy consumption in municipal and school buildings and the project provides a valuable technical resource to communities like Fairfield,” says Sheri Borrelli, United Illuminating. 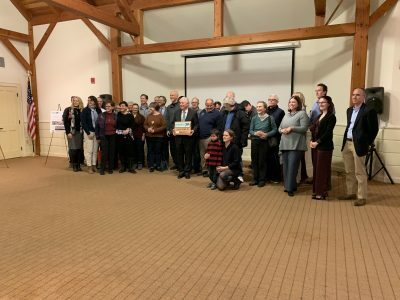 The Sustainable CT Initiative, which began last October, awards certifications to towns and communities across Connecticut that achieve high standards across a variety of sustainability accomplishments. The program gives awards in three categories based on the amount of points received. The highest ranking is a Gold Certification, the second is the Silver Certification, and the last is the Bronze Certification. The town of Fairfield earned tops honors for the program, being one of only five towns in the state to receive a Silver Certification. In addition, Fairfield also received the highest ranking in the Silver category, deeming the town the “Most Sustainable Town in Connecticut”. Some of the most notable accomplishments that were cited from the Fairfield application were building awareness of the town’s history, assessing potential town-wide impacts of climate change, supporting projects such as recycling, composting, green space preservation, and complete streets policies, and increasing the use of solar energy systems across the town.